I’ve just returned home from my nice week in Madrid and had somewhat of an interesting trip home. As a follow-up to my prior post on booking this trip, I was worried I”d signed myself up for a frustrating flight experience with Iberia.. I’ve had plenty of frustration with their strange baggage policies, slow agents at Madrid, and dingy aircraft. I’ve come to learn that using Your oneworld Elite Benefits on Iberia award travel takes work. As a OneWorld elite status holder, you’re entitled to some nice perks when traveling on any oneworld airline, which includes Iberia, regardless of class of service flown. This particular flight was booked using Iberia Avios points so my Iberia Avios account number was added be default I’d been unable to add my AAdvantage number to my booking so that I can use my oneworld Emerald benefits on my journey. I wasn’t able to have it added to my booking by calling customer service either. I was hoping that when I arrived at the airport in Madrid, an Iberia agent would be able to add my AAdvantage number. So how did it work out without my AAdvantage number on my reservation? On arrival at the Madrid Airport, I headed to the Priorty/Business check-in area to speak with an agent. She attempted to add by AAdvantage number but then decided I wasn’t allowed because I was on an award booking. She claimed I wasn’t entitled to any elite benefits on an award booking, which I knew was false. I asked if I showed by Executive Platinum card, if I could use fast track security and the Iberia lounge. She said “maybe”. So now we’ve gone from “No” to “Maybe”. I headed towards fast track security with my boarding pass and my Executive Platinum card which I presented to the security agent. He took a look at both and allowed me to proceed with no issue. Whew! Fast track security at Madrid is a big time saver. There were only 2-3 people in line for fast track security. 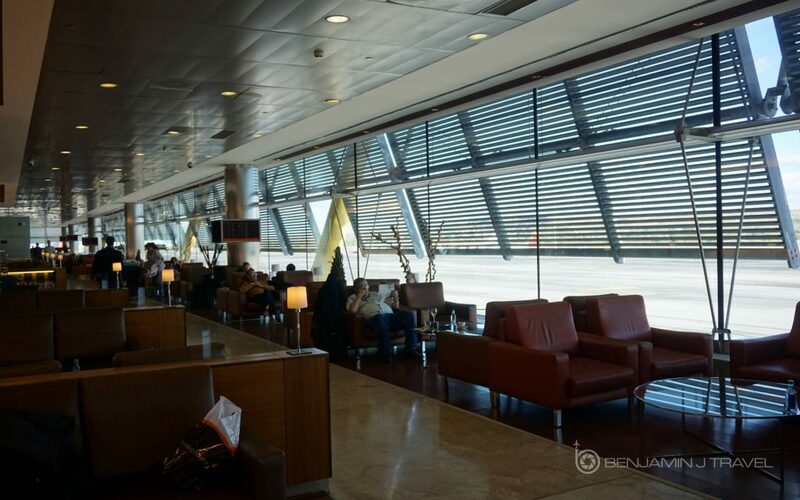 After clearing security and taking the train to Terminal 4S, I headed to the Iberia lounge for the non-Schengen departures. I presented my boarding pass and Executive Platinum card to the lounge check-in agent. He ran my information several times in his computer and after a bit of waiting, she said I was good to go. Whew! I didn’t feel like spending 90 minutes in the terminal and the Iberia lounges are fairly nice. Now for the final test, it was time for boarding. My boarding pass had a dreaded Group 3 assignment which I would not be thrilled with. All the U.S. bound flights at Terminal 4S depart from the same end of the terminal which is behind a secondary screening area. There was a Priority line for secondary screening and they were strictly enforcing “Priority only”. I approached with my boarding pass and Executive Platinum card and was admitted no problem. I was glad that I left for the gate early as boarding started 20 minutes early. As I boarded through the Priority line, I showed my boarding pass and Executive Platinum card one more time and was allowed to board as Priority. Relief! Ultimately, everything worked out for me with fast track access, lounge access and Priority boarding. But it certainly would have gone a lot smoother with my AAdantage number on my boarding pass. I was really at the mercy of each agent to allow me to use my Priority benefits. If you’re an Iberia elite customer, you shouldn’t experience any issue. This should only apply if you’re a status holder on a oneworld partner airline booked using Iberia Avios points. Considering the Iberia ground service at Iberia can be very poor, be prepared to jump through some extra hoops if you find yourself in this same scenario.